Now that we understand the resources available in Hearthstone we should begin to look at how they affect the way decks are designed and the facets of deckbuilding. 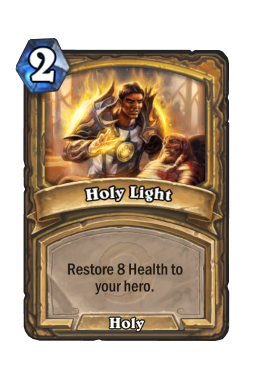 The ultimate goal of a game of Hearthstone is to reduce your opponent’s health total to zero while keeping your own health above zero. That is the simplest form of resource superiority, but the concept is by no means limited to that. It encompasses all of the resources previously discussed and recognizes that gaining superiority in any of the categories will benefit the player. So how do we go about getting superiority? Well, the three mains ways are efficiency, acceleration, and disruption. Lets take a closer look at each of these methods. When we consider the efficiency of effects what we are really looking at is the conversion rate between resources. 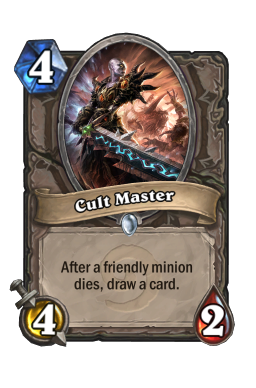 Resources are constantly being converted into different and sometimes even the same resources in Hearthstone. 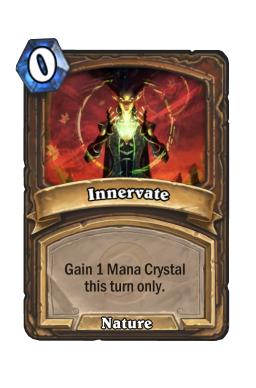 A card like innervate converts a card into mana; a hero power like Lifetap converts health into cards; weapons convert health into attacks; a card like arcane intellect converts a card into more cards; and this is just a small sample of the types of conversions going on in the typical game of Hearthstone. To understand effect efficiency we have to identify the type of resources that are being converted before we can identify the efficiency of a particular effect. Lets take a look at some examples to help illustrate the concept. Mana to Damage - As we said earlier, we can only determine the efficiency of an effect by looking at it relative to similarly costed effects. 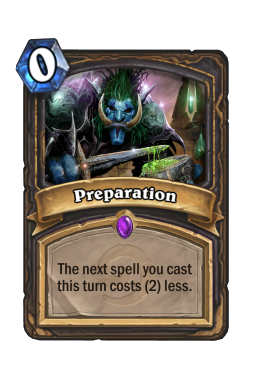 So to get an idea about the efficiency of mana to damage let’s take a look at the Priest card Mind Blast and the Mage card frostbolt . Both of these cards cost 2 mana to cast. 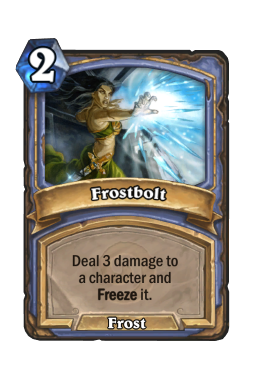 Yet, Mind Blast provides 5 damage whereas Frostbolt provides 3. 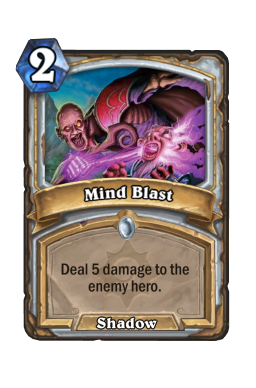 Yes, Mind Blast is limited to dealing damage to the opposing hero, but if we are only considering the efficiency of mana to damage then Mind Blast far outperforms Frostbolt. 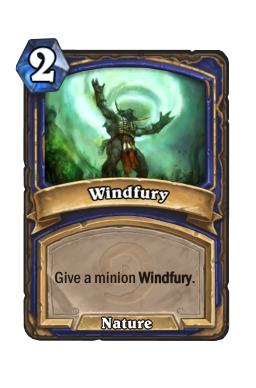 Therefore, we can say that the mana to damage efficiency of Mind Blast is greater than Frostbolt. Cards to Damage - Next let's consider the efficiency between cards and damage. 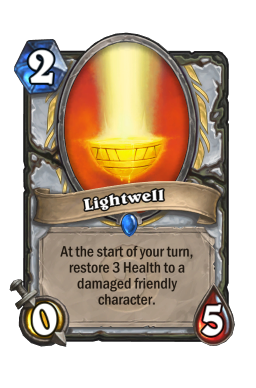 We can stick with the Priest card Mind Blast for this scenario, but let’s compare it to the Mage card pyroblast . 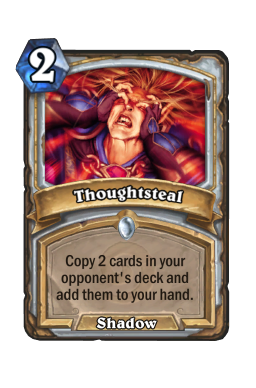 Both Mind Blast and Pyroblast are one card. Thus, they cost a similar amount of the resource we are addressing now. 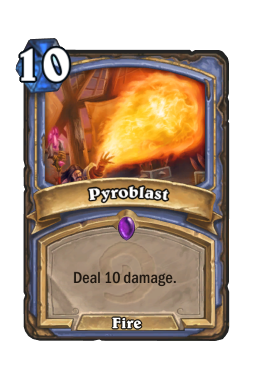 However, while Mind Blast does 5 damage, Pyroblast does 10 damage. 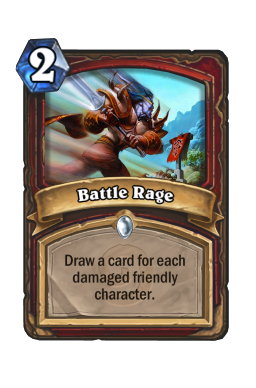 This means that Pyroblast is twice as efficient at converting cards to damage as Mind Blast. These examples should give you an idea of how efficiency is framed by the type of resources that are being converted. We only looked at a couple of the simplest conversions, but this rule applies to all of the different types of conversions in Hearthstone. So now that we have an idea of how effect efficiency functions it should be a small jump to understand how this can lead to resource superiority. Since both players will be converting resources throughout a game of Hearthstone the player who is doing so in a more efficient manner will end up with resource superiority. This is why cards that cost zero mana have the potential to be so powerful. A zero mana effect has infinite efficiency when looking at the conversion of mana to effect. 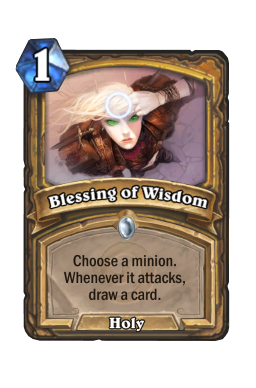 As long as the card has a decent conversion between cards to effect then it will be supremely powerful, as it represents a pure resource advantage when played. This is also why answers have value. In part one of this series we discussed how answers have inherent risk due to the limitations placed on their interactivity. If you have an answer in your hand and there are no legal targets for that answer, then it is effectively useless. So if playing an answer in your deck runs the risk of you having a dead card, why do people even run answers? If this is the case, it seems logical that you would simply be better off ignoring answers entirely and just running more threats. The reason is efficiency. While there are exceptions, answers on the whole tend to be more efficient at converting resources than threats. So if you have the proper answer for a threat you will generally gain resource superiority when they interact. Now that we understand this let’s move on to the next subpart of efficiency. The second component of the efficiency concept doesn’t consider conversion of resources, but instead focuses on avoiding wasted resources. 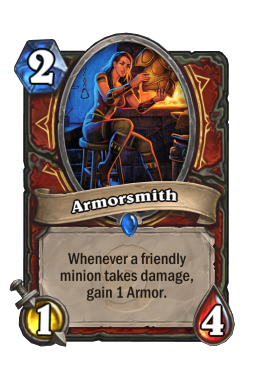 As we discussed during the section outlining the types of resources in Hearthstone both mana and attacks are perishable resources. This means that if you don’t fully utilize your supply of these resources on a given turn you will no longer have access to that resource on following turns. Let’s take a look a hypothetical situation to show how this can affect a game. Jaina and Thrall are playing another game of Hearthstone. It is turn two of the game. 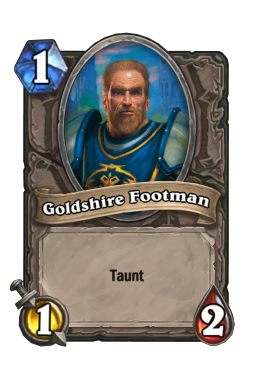 Thrall plays a goldshire footman using one of his two available mana and passes the turn. This is what is referred to as “floating” a mana. Thrall had access to two mana on his turn and only used one. Unlike Thrall, Jaina understands efficiency and wants to use all of her mana. On her turn she has two available mana as well, so she plays the two cost minion frostwolf grunt and passes the turn. Thrall sees Jaina’s Frostwolf Grunt and thinks it might be a good idea to play his too. 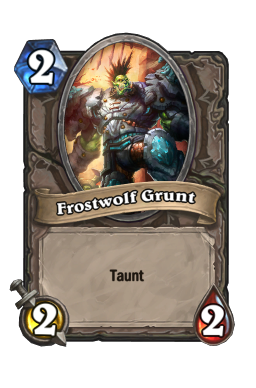 So, on his third turn he plays a Frostwolf Grunt and again floats a mana for the turn. Jaina wants to use all of her mana so she spends all three of it to play an ironfur grizzly and passes the turn back to Thrall. 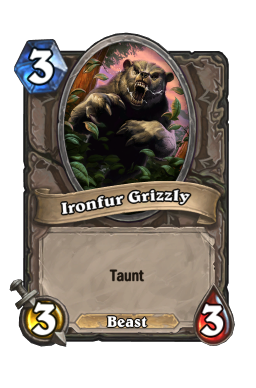 Thrall continues his copycat behavior and decides to spend his 4th turn playing an Ironfur Grizzly of his own once again floating a mana for the turn. Jaina ever vigilant to use her mana plays a senjin shieldmasta on her 4th turn. So lets take a look at what has really happened so far. 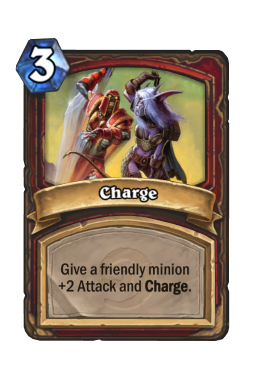 Thrall played minions with the following stats 1/2, 2/2, and 3/3 therefore Thrall has committed a total of 6 attack and 7 toughness to the board. In the same turns Jaina played a 2/2, 3/3, and 3/5 and as such she has a total of 8 attack and 10 toughness. 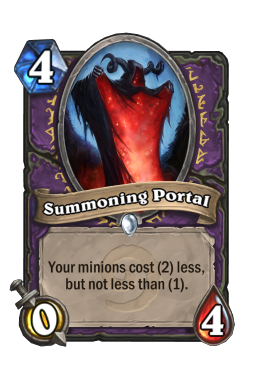 This means that after just three turns of inefficient mana usage from Thrall, Jaina has a full 2 attack and 3 toughness advantage in cumulative stats on the board. 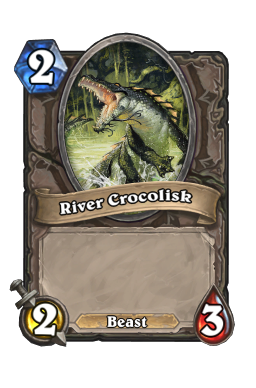 Since we know that efficiency is always relative this means that Jaina’s progression has been efficient enough to equate to an additional river crocolisk in play on her side of the board. Thrall will need to find ways to recoup this advantage from Jaina or he will have a very tough time winning the game. By using her mana more efficiently Jaina was able to develop a mana advantage. 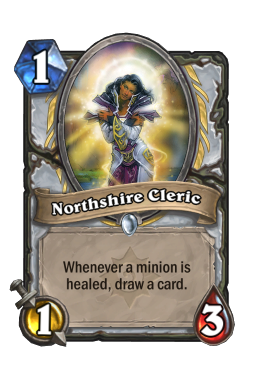 Because she didn’t waste any of her available mana she will have more access to mana for the duration of the game. As a general rule having access to more resources is beneficial. 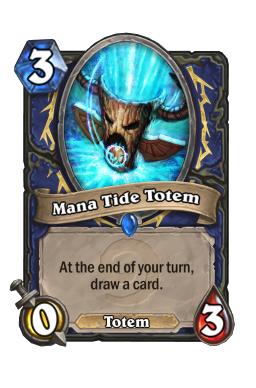 However, this does not mean that being mana efficient is always the correct play. High level play requires you to consider mana efficiency as only one factor in evaluating your plays. All things being equal, you should aim to be mana efficient, but don’t let yourself become a slave to the idea. The second method of achieving resource superiority is through resource acceleration. The two methods of resource acceleration are finite and contingent. Both types of resources acceleration require investment of resources to achieve acceleration. The distinction between finite and contingent resource acceleration concerns the potential return on this investment. Finite resource acceleration has a definite return for the investment, whereas, contingent resource acceleration has an indefinite return for the investment that is based off of some external factor. Let’s look at some examples of the two types of resource acceleration to better understand how they are different. These types of resource acceleration all provide a short term boost in your resources. As you can see there are finite means of resource acceleration for all of the different types of resources in Hearthstone. However, the access to these types of effects vary greatly. From cards at one end of the spectrum with a large number of options to attacks at the other end of the spectrum with a only single card offering finite acceleration of that resource. These types of resource acceleration all provide uncertain returns on their investment. The means of contingent acceleration are grouped together, but as these examples show there is some variety in how they function. 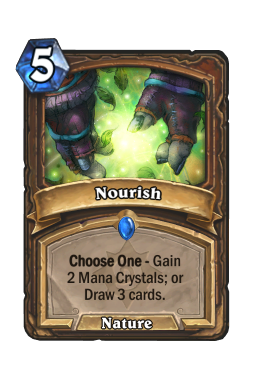 Take for example, Wild Growth , we know that this card offers a contingent mana acceleration, but what is it contingent on? Well, the effect of Wild Growth is contingent upon two main factors. First, how early in the game it is played. 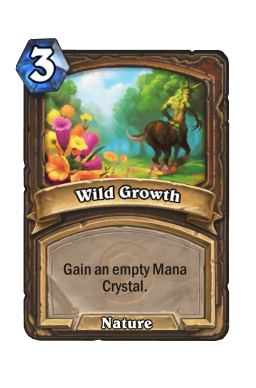 If you play Wild Growth on turn one you will have one extra mana for the next eight turns. After that point you would have reached the ten mana maximum even without Wild Growth so it is not providing any additional benefit. So, if you play Wild Growth on turn one of the game you have effectively accelerated your mana by eight. However, if you wait until turn eight to play wild growth, you will only have one additional turn where you will receive benefit from it. Therefore in this scenario you will have only accelerated your mana by one. So as you can see, the turn on which an effect like Wild Growth is played has a direct correlation with the effect it produces. The second factor in determining its effect is how long the game actually lasts. 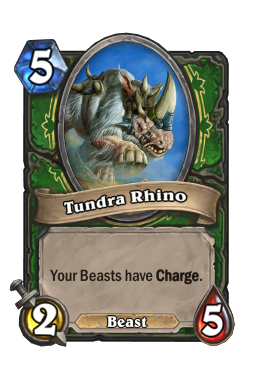 For instance, if you played Wild Growth on turn one as before you would expect to get eight accelerated mana, however, that will not be the case if the game is over on turn six. 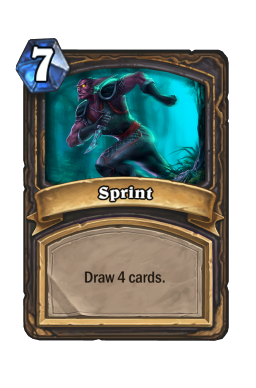 If the game ends on turn six you will have received less than the eight mana acceleration that was expected. This makes the length of the game a limiting factor for the potential resource acceleration the card offers. So what lesson can we learn from this? Well, as a general rule when you invest resources into contingent acceleration you are better off doing so earlier in the game. The earlier in the game that you commit resources into developing a means of acceleration the more time you have to reap benefits from that investment. Lets take a look at another method of contingent acceleration to compare the effects. This time lets consider Gadgetzan Auctioneer . 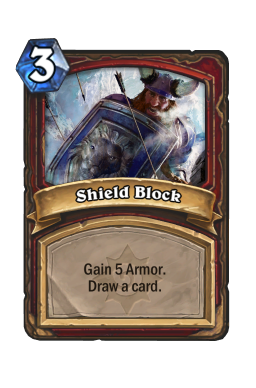 There are three factors upon which the card acceleration provided by Gadgetzan Auctioneer hinges. The first, and most obvious, is the survival of the minion. If Gadgetzan Auctioneer is killed you will no longer be able to use it as a source of card acceleration. 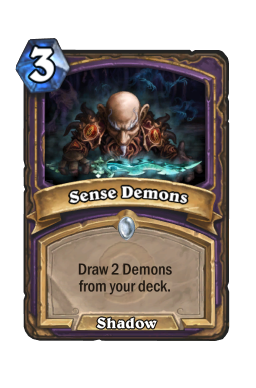 The second factor is the number of spells you have in your deck. 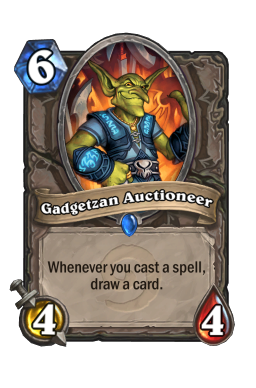 You will only be able to activate Gadgetzan Auctioneer’s ability with spells, so the ability to accelerate cards is directly related to the access to spells in the player’s deck. The final limiting factor is the number of cards remaining in your deck. 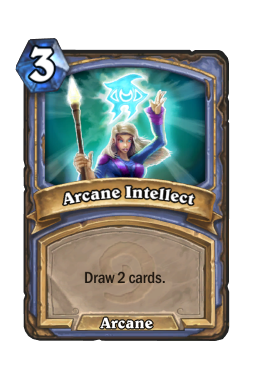 For instance, if you play a Gadgetzan Auctioneer with only 2 cards left in your deck its ability to accelerate your card supply is extremely limited. So what can we learn from Gadgetzan Auctioneer? Well, with Wild Growth we found that the earlier it was played the more return on investment we could achieve. There is some truth to that with Gadgetzan Auctioneer, but as a minion Gadgetzan Auctioneer has vulnerabilities as well. 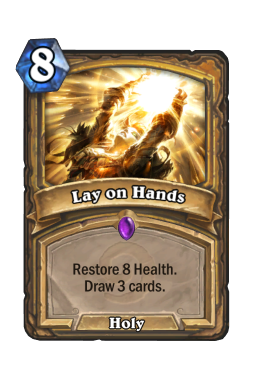 If you simply play it on turn five then your ability to utilize its effect would be very limited and it is highly likely that the opponent will kill it if he/she has the ability to do so. 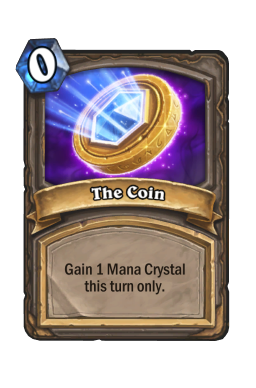 In order to get more return on this investment it is often better to wait until you have more access to the resources you need to utilize it (mana & spells). As we can see, the two examples of contingent acceleration have very different factors upon which they rely. Yet, despite their differences they are similar because they both have a power level that scales in relation to the limiting factors upon which they rely. This is what defines contingent accelerators. Now that we understand the distinctions between the two types of accelerators let’s consider the practical ramifications of them. Because finite methods of acceleration offer little to no risk in their application these types of effects tend to offer reasonable power levels. You are risking little by playing these effects so you can’t expect a high reward. Contingent accelerators, on the other hand, offer varying levels of risk with their play and consequently offer varying levels of reward in their usage. They tend to have a very low floor on their usefulness and a very high ceiling on their potential gains. The type of effect you include in your deck should be related to your tolerance for this type of risk. Disruption is the inverse to acceleration. Instead of increasing your access to a resource you aim to gain resource superiority by reducing the access of your opponent to that resource. 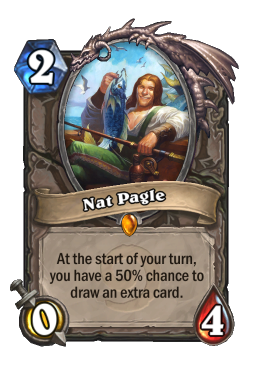 As of this point in Hearthstone there are only means of disrupting three of the types of resources in the game. Lets begin by looking at the different resources and how they are disrupted. Let's address mana disruption first because the ability to attack this resource is extremely limited. 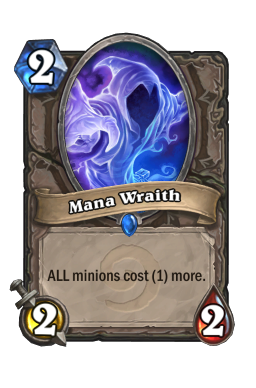 In fact, there is only one card in the game that can attack mana as a resource and that is mana wraith . Mana Wraith limits player’s ability to convert mana into minions by increasing the conversion rate. The problem with Mana Wraith is that it has what is called a symmetrical effect. That simply means that it has the same effect on both players. This makes it hard to garner resource superiority from Mana Wraith as you are affected by it as well. Yet, there is a way to abuse symmetrical effects such as this and I will mention it for the sake of completeness. If you play a Mana Wraith, as the last thing you do on your turn, it will be in play during your opponent’s turn (assuming they don’t remove it), thus limiting his/her ability to utilize his/her mana. Then, once it is your turn, you can intentionally kill your Mana Wraith to lift the effect from play. This is not a terribly powerful way to abuse the symmetrical effect, but it does exist, so it should be mentioned. Cards that attempt to disrupt your opponent’s access to attacks are far more common. In fact, all of the cards we discussed previously as “answers” fall under this umbrella. Remember that an answer is anything that nullifies a threat. So, in effect, by nullifying that threat you have limited the access of your opponent to the attacks that the threat represented. A large percentage of the cards in Hearthstone fall under this category. As we know the simplest form of resource advantage is reducing your opponent’s Health to zero while yours is still above zero. 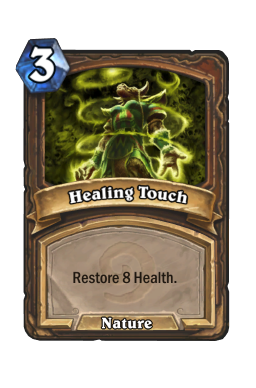 This is the fundamental goal of Hearthstone and, therefore, disrupting your opponent’s health is an essential part of every game of Hearthstone. There are a number of ways to go about achieving this goal and we will address them further in the next article of the series, as we look at the basic deck archetypes in Hearthstone.